The shape of love: why a heart and not a circle? Don’t be a punk; check your junk! Sequels, prequels and remakes, oh my! Fairview Suites up and running: underwhelming and overpriced? Wouldja look at that engagement! The new playground: Has shopping replaced healthy leisure activities? A take on Herman Cain: Qualified to be president? Has UFC resurrected the sport of boxing? Claude Giroux: Most Valuable Player? ‘Know your enemy’: Vandalism or political activism? Against the Cage: Condit reigns & Diaz resigns? Y u no respect Katy Perry? Dr. Deborah Klens-Bigman performs for Sakura Sunday at the Cherry Blossom Festival in Philadelphia. Lock Haven University will host its seventh annual Celebration of Scholarship (COS) April 24, which allows students, faculty, and alumni to present their research. 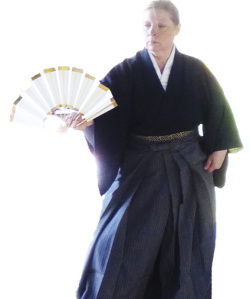 This year, nine alumni are participating in COS.
–Deborah Klens-Bigman graduated in 1971, is a swordsmanship instruction and works in New York City as an instructor in the Aquatics and Recreation Program at LaGuardia Community College. She will demonstrate a form of classical Japanese dance, kabuki buyo. –After Diana Hartman graduated in 1975 she founded a business, COMP Assist, to provide safety and work cost control consulting to Central Pennsylvania employers. Hartman received the LHU 2008 Alumni of the Year Community Service Award. “I want graduates to understand that being actively involved in community volunteerism can be the difference between a successful career and a floundering career,” said Hartman. –Wesley Tothin graduated in 2011 and later earned a master’s degree in history. The graduate assistant for the Entrepreneurial Leadership Center at LHU will explore the study of history. –Luke Stewart, a 2002 graduate with a degree in biology and a minor in chemistry, will showcase the ground-breaking technologies in biology. –Renee Rosier, who has a doctorate in biology, graduated in 2007 and is currently a postdoctoral research associate and lecturer at Penn State. She will serve as the assistant professor of biology at Penn State Wilkes-Barre in July. Rosier will present her research project on the behavior of lizards at Raystown Field Station. –Alex Borzok is a research assistant at the University of Maryland’s School of Dentistry. He graduated in 2009 with a bachelor’s degree in health science, pre-professional track, and a minor in biology. Borzok’s presentation will explore his interest in the pathogen chlamydia trachomatis, what Borzok calls “the secretive love bug”—because of the difficult, tedious work he needs to do in order to study the microbe. Faith Baker on Don’t be a punk; check your junk!